The name “Volkstricken” originated as my online knitting handle. I don’t know how long the original blog ran, but in 2009 I began to feel odd about it. I was weirded out that there were so many public photos of me modeling my knitting out there on the internet. I was embarrassed that despite my fancy-pants art school degree, I was working two part time jobs and knitting instead of developing a fine art practice and applying for residencies and grad school. I felt it was distracting me from real work/becoming an adult/whatever. So one day, I deleted it. Long story short: I sewed this top and I’m not at all embarrassed about it. Please note hair flip is in full effect. It’s the Sencha Top from Colette Patterns, view 2. Fabric was something purchased on clearance from Joann’s last year – I don’t normally wear red, but this was love at first sight. What I love about this top are the details. The darts around the neckline, for example. 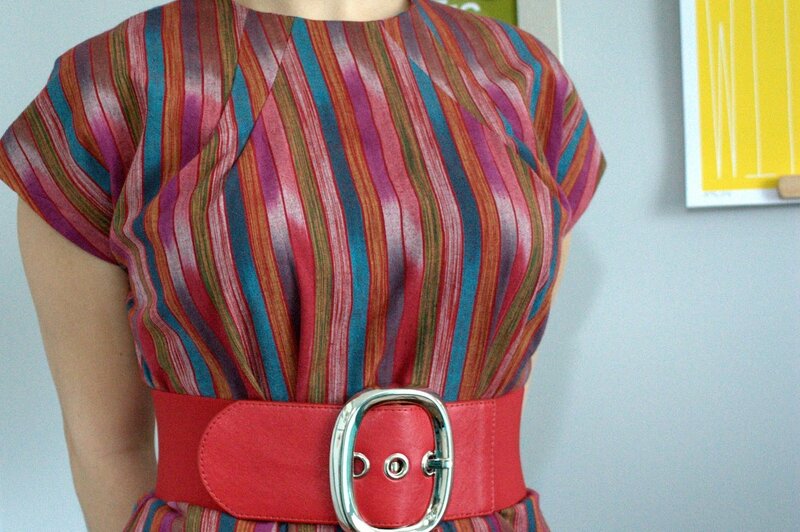 I love how the stripes (almost) line up across those seams. Maybe once my sewing skills improve, I can make that happen. The back is my absolute favorite. 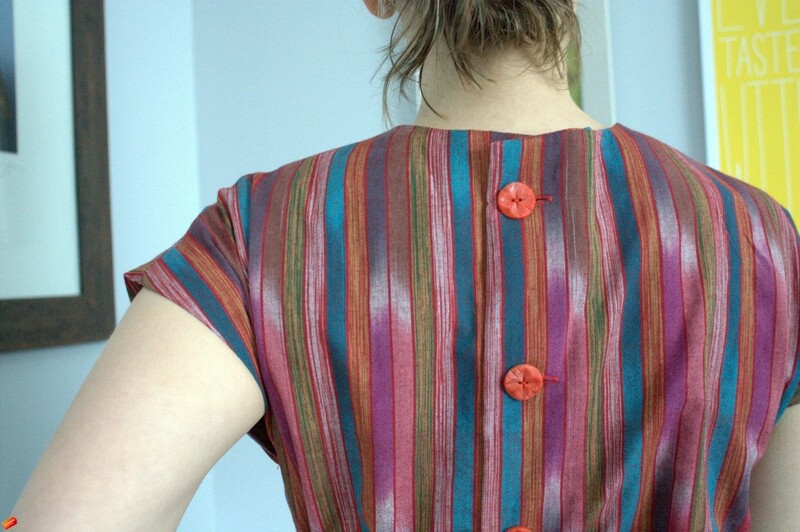 Tops that button up the back have really been catching my eye lately. And I had an excuse to dig out some wonderful vintage buttons from my collection – these have a great shape, although the color has faded in some spots. I do have a handful of fit issues – it looks great with a belt, but terrible without. It sort of rides up in front and pulls down in the back. Although I think my general sewing skills are pretty solid, I am terrible at diagnosing fit issues and making adjustments – a skill I need to work on. I might start by making a new test top one size smaller than this and attempting to modify the neckline, as it’s just too high for my taste for everyday wear. It’s also worth noting that this top has a decent amount of handsewing. The button band facings and sleeve hems are all handsewn. That might have scared me away if I had know this before purchasing – but all told, it was very simple and actually quite relaxing. As for the blog, I’m glad it’s back. That’s some hot stuff there dude. Glad my favorite blog related to hobbies we don’t share is back in action! But we DO share them, in that you periodically get handknit stuff you don’t want. Hehe. I look forward to seeing more of your sewing/knitting/etc.! Just found your blog (thru Ravelry) Your hat is adorable. And cool. I also love how neat it is, your attention to detail is amazing! I was just going to “Pinterest” one of images of your hat and then I read this^^post, and I paused. Would you mind, or would you perhaps even be flattered? On Pinterest right-clicking on the image would link directly back here, to your blog. If you prefer that I wouldn’t, I would of course understand and respect your wishes. Hi Dorothea! Thank you :) I am actually on Pinterest myself (pinterest.com/volkstricken) and would be totally flattered to be pinned. Definitely add some photos to Ravelry when you are done knitting the bonnet, I am anxious to see some finished projects since this is my first time writing up a pattern!! hey, you’re back! i stumbled upon your blog by seeing your adorable hat in my ravelry friends photostream. glad to see you blogging again. Yay! I’m glad to be back! I so regret deleting my previous blog… oh well.